This November 15, 2014, photo shows handguns in a display case at Metro Shooting Supplies in Bridgeton, Missouri. The number of firearms being stolen in the United States is staggering—and while policymakers must take steps to mitigate this concern, gun dealers and private gun owners have a responsibility to ensure that guns are not vulnerable to theft. Stolen guns become untraceable and thwart the ability of law enforcement officers to solve violent crimes. When a gun is recovered in connection with a crime, local police departments can submit identifying information about the gun to ATF for tracing—a process that allows ATF to identify the licensed gun dealer that originally counted the gun as part of its inventory. When a gun is lawfully purchased from a gun dealer, the dealer retains paperwork that identifies this first retail purchaser. The dealer can then provide this information to law enforcement upon request as part of a crime gun trace. This can be a crucial investigatory lead for local investigators working to solve a violent crime. When a gun is stolen from a gun dealer’s inventory, however, this investigative lead immediately goes cold, making it more difficult to identify potential suspects. Guns that are stolen from individual gun owners are similarly untraceable. While ATF can identify the first retail purchaser of a gun, the investigative trail ends when that person reports that the gun has been stolen. Gun stores are obvious targets for criminals looking to steal guns. Indeed, ATF has reported a substantial increase in robberies and burglaries of gun stores over the past five years. Between 2012 and 2016, burglaries of licensed gun dealers increased 48 percent, and robberies of licensed gun dealers increased 175 percent.14 During this period, nearly 31,500 guns were stolen from gun stores nationwide.15 However, these thefts are not evenly distributed across the country. Thefts from gun stores are more prevalent in the South, with seven of the 10 states with the highest number of firearms stolen from gun dealers located in the southern region of the United States. Some states also experienced a sharp increase in the number of guns stolen from dealers in 2016. These thefts increased 122 percent in Georgia from 2015 to 2016, from 515 guns to 1,144 guns. California and South Carolina saw a 174 percent increase and a 383 percent increase, respectively, during the same period.16 A nonexhaustive list of examples of gun store thefts from nearly every state are included in the Appendix of this report. 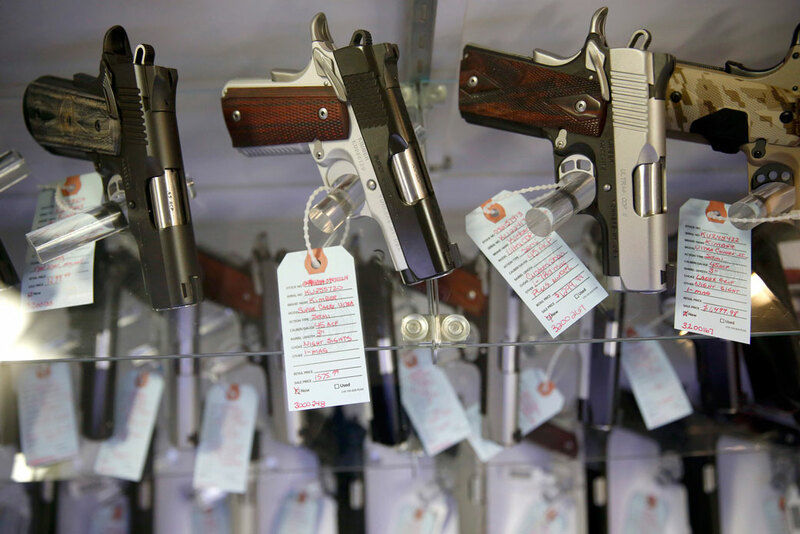 Law enforcement officials across the country have become increasingly concerned about gun thefts from both gun stores and individual gun owners. These organizations have proposed several policies and actions that can be implemented to mitigate the number of stolen firearms. Enact federal legislation to require licensed gun dealers to implement certain minimum security measures, such as securely storing guns after business hours and installing alarm systems and cameras. Eliminate the rider on ATF’s budget that prevents the agency from requiring licensed gun dealers to conduct an annual inventory reconciliation. Provide ATF with additional resources to conduct more frequent gun dealer compliance inspections. Implement laws or policies that require or incentivize gun owners to store firearms securely. Enact federal and state legislation requiring gun owners to promptly report all stolen or lost guns to law enforcement. With close to 300 million guns circulating in the United States, gun owners and dealers have a substantial obligation to ensure that they are not vulnerable to theft. While there are many factors that contribute to firearms being trafficked to secondary markets, thefts play an important role. Lawmakers should look at the high number of stolen guns and consider implementing these smart laws and actions to reduce theft. The number of stolen guns in the United States is staggering. Whether taken from gun stores or from individual gun owners, a firearm is stolen every 2 minutes. These stolen guns are often diverted directly into illegal trafficking networks and end up being used in the commission of violent crimes. Gun owners and gun dealers therefore have a compelling responsibility to take measures to help ensure that all guns in their possession are not vulnerable to theft. Implementing the policy recommendations in this report would be a smart and commonsense step forward in helping to reduce gun thefts and protect community safety. Below is a nonexhaustive list of incidents of gun store burglaries and robberies across the states. The authors looked at online news sources to identify recent cases. Forty-five guns were stolen during a burglary of this gun store. Eighteen guns were stolen during a burglary of this gun store. A lone perpetrator stole three pistols and a rifle from this gun store. A group of perpetrators stole 23 guns from this gun store. A truck was used to smash through the back entrance of this pawn store, allowing four perpetrators to steal 64 guns. A group of perpetrators burglarized seven different gun stores in Orange, Riverside, and Los Angeles counties during a four-month period, stealing a total of 128 guns. Armed perpetrators stole 13 handguns and critically injured an 85-year-old man during a robbery of this gun store. A group of perpetrators broke into four gun stores during a three-month period and stole a total of more than 45 guns. Thirty-five guns were stolen during a burglary of this gun store. A group of four perpetrators broke into this gun store and stole 12 guns. Perpetrators used a stolen car to drive through the window of this gun store and steal an unspecified number of weapons. Three perpetrators stole 14 firearms from this gun store. Robbers drove a truck through the window of this gun store and stole an unspecified number of firearms before driving away. Nearly 50 guns were stolen during the second burglary of this gun store in just over a month. A group of more than 10 suspects broke into this gun store around 3:00 a.m. and stole approximately 40 guns. They gained entry to the store by ramming a truck through the storefront. Perpetrators used heavy machinery to break a hole in the concrete wall of this gun store, then stole 42 handguns in a burglary that took only 60 seconds. A thief stole 55 guns from this gun store. Four thieves stole more than 40 guns during a burglary of this gun store. Seventeen guns were stolen by an unknown number of perpetrators from this hunting supply store. Two guns were stolen from this pawn shop. Perpetrators used a cinder block to break the window of this gun store and range, then stole at least 40 firearms. A pair of perpetrators used a stolen truck to smash through the security gates in the parking lot of this general retailer, then broke the store’s windows and stole 39 guns and at least 1,000 rounds of ammunition. Two perpetrators stole three guns, ammunition, and accessories during a burglary of this gun store. Armed robbers stole 43 guns from this gun store during a robbery that occurred during business hours. An unknown number of firearms was stolen from this gun store. A thief stole thousands of dollars worth of firearms from this gun store. Perpetrators drove a vehicle into the front of this gun store, then stole an unknown number of guns. Three perpetrators stole more than 50 guns from this gun store. A lone thief stole 16 handguns in a smash-and-grab robbery of this pawn shop. A pair of perpetrators stole 30 guns during a 90-second burglary of this gun store. Five perpetrators stole 36 guns, cash, and other items from this bait and gun store during an armed robbery. Perpetrators broke into this gun store, stole more than 70 handguns, then set the store on fire, destroying it. Thieves stole four handguns from this gun shop. Approximately 30 handguns were stolen from this sporting goods and gun store during a burglary in which the perpetrator used a hammer to smash through a glass display case. Three armed perpetrators stole 26 guns from this building materials store during an after-hours burglary. A group of three perpetrators broke into this gun store and stole approximately 75 guns. A thief used a truck to ram through the front of this gun store and stole nine handguns. Thieves used a U-Haul truck to back into the front of this gun store and escaped with at least 20 guns. Thirteen guns were stolen during a burglary of this sporting goods store. Two thieves stole 39 handguns in two separate robberies. An unknown number of perpetrators stole 27 firearms from this gun store. A pair of thieves stole four firearms from this gun store. Four thieves used an SUV to ram into the storefronts of three gun stores in a three-hour span and stole an unspecified number of firearms. Two perpetrators smashed the front doors of this gun store with a sledgehammer, then stole nine handguns. Twenty-five guns were stolen from this gun store during a burglary. Five rifles were stolen from this store during a burglary. A group of perpetrators broke into these two gun stores on two separate occasions and stole multiple firearms from each store. Four thieves stole at least 44 guns from this store. A group of three perpetrators broke into this gun store by shooting out the glass in the front door and stole a total of six guns. A pair of perpetrators stole 30 guns from this gun store. A team of perpetrators burglarized three gun stores during a four-day period, stealing a total of 77 guns. An unknown number of perpetrators stole 26 guns from this store. Four revolvers, two semi-automatic handguns, and one AR-15 assault rifle were stolen by a perpetrator from this gun store. Eleven handguns were stolen during a burglary of this gun store. A pair of perpetrators burglarized three gun stores during a two-month period, stealing a total of 93 guns. A pair of perpetrators stole five rifles during two separate robberies of this store. Two perpetrators stole seven firearms and critically wounded one person in a robbery of this gun store. An unknown number of perpetrators stole 229 firearms from this gun store during Hurricane Matthew. An unknown number of perpetrators stole 25 guns from this gun shop, three of which were later connected to a homicide and a police shooting in Denver. An unknown number of perpetrators conducted a smash-and-grab robbery and stole 45 handguns and rifles from this gun store, marking the first of two gun store robberies in this area in two weeks. Thieves stole 15 handguns and a rifle from this gun store, marking the second gun store robbery in the area in a two-week span. A group of perpetrators used a stolen truck to pull the door off of this gun store, then stole more than a dozen guns. Perpetrators drove a stolen truck through the brick wall of this gun store, then stole multiple guns. A pair of perpetrators broke into this outdoor sports store and stole more than 50 guns. A group of roughly 10 perpetrators stole more than 50 firearms during a burglary of this gun store. Two thieves stole nine firearms, including two machine guns, from this gun shop. A perpetrator broke into this gun store and stole 12 handguns from a display case, then drove to Hartford, Connecticut, and traded the guns to a drug dealer in exchange for heroin and cocaine. Thirty-two guns were stolen during a burglary of this gun store. Three perpetrators robbed three gun stores over a four-day period, stealing more than 35 semi-automatic handguns. A perpetrator broke into this gun store on two separate occasions and stole a total of four rifles. Four perpetrators burglarized this gun store and stole 56 firearms. Four thieves store 31 firearms from a gun range during this burglary. An unspecified number of thieves stole more than 100 firearms from this gun store. An anti-government extremist used a hammer to break through the front windows of this gun store; stole 18 guns, two silencers, and ammunition; then led authorities on a manhunt. The store had been burglarized less than a year prior to this incident. Eleven semi-automatic guns were stolen during a burglary of this gun store. Three perpetrators broke into this gun store and stole an unspecified number of firearms. Chelsea Parsons is the vice president of Guns and Crime Policy at the Center for American Progress. Her work focuses on advocating for progressive laws and policies relating to gun violence prevention and the criminal justice system at the federal, state, and local levels. In this role, she has helped develop measures to strengthen gun laws and reduce gun violence that have been included in federal and state legislation and as part of then-President Barack Obama’s January 2016 executive action announcement on gun violence prevention. Prior to joining the Center, Parsons was general counsel to the New York City criminal justice coordinator, a role in which she helped develop and implement criminal justice initiatives and legislation in areas including human trafficking, sexual assault, family violence, firearms, identity theft, indigent defense, and justice system improvements. She previously served as an assistant New York state attorney general and a staff attorney clerk for the 2nd U.S. Circuit Court of Appeals. Eugenio Weigend Vargas is the senior policy analyst for the Guns and Crime Policy team at the Center. His work has focused on public security. He has conducted research on arms trafficking, organized crime and violence, firearm regulations in the United States, and the illegal flow of weapons to Mexico. He has a Ph.D. from Tecnológico de Monterrey and a master’s degree in public affairs from Brown University. The authors wish to thank Daniel Berkson for research assistance for this report.